We're spending another day of celebrating Christmas today. Yesterday was spent traveling with the twins to my parents house, while today we celebrate Christmas with the Artist's family, at the old farmhouse. What exactly is Boxing Day, you ask? Sadly, today it is comparable to Black Friday in the U.S., as giant retail stores feel it's necessary to give their employees only one day off at Christmas, in the hopes of making another buck or two and should the day fall on the weekend, it is observed on the following working day for those who don't work in retail. I don't agree with this johnny come lately shopping phenomenon and you won't find me out browsing for stuff I don't need today. The origin of Boxing Day can be traced back to our country's English ancestors. Traditionally, a day for the servants and working class to have a day off to celebrate Christmas with their families. The exact etymology of 'Boxing' however remains a mystery. No matter the history, we are thankful for another day of celebrating with family. The smell of turkey coming from the farmhouse kitchen is toying with my stomach while the sounds from our newest Christmas CD is truly enchanting. 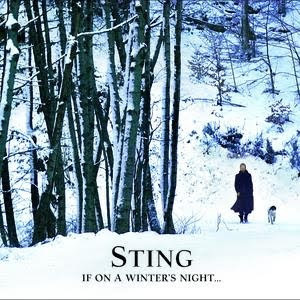 I gave my husband Stings newest album 'If On a Winter's Night' and it's a true delight. To call it a Christmas album is a bit of a misnomer, it's really a winter album, full of old medieval songs. It will be a treasure to listen to while sitting in front of the fire, while the wind and snow whirls around the old farmhouse and fall is all but forgotten and spring is just a dream. May the Christmas spirit still be with you. Your site is so enchanting... loving the snowflakes, even though I feel like I need to stop typing when one nearly touches the cursor! Hope your Christmas was as magical! That's one lucky husband geting Sting's CD for Christmas! I love the first song on your player. It's beautiful. I've heard Sting's album is great. We will have to pick up this new Sting album. I love your blog...it is such a nice place to rest! ;) Living in Poland they do NOT open the stores until three days after Christmas. Nice, huh? Everyone has time with family and friends.